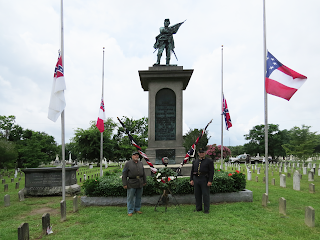 In recognition of the sesquicentennial of the Civil War's epic Battle of Gettysburg, Magnolia Cemetery held a special memorial service on July 1. The event's purpose was to recognize and honor the sacrifices of tens of thousands of soldiers, North and South, who fought, died and were wounded during the pivotal three day battle 150 years ago. Buried at Magnolia Cemetery are 82 South Carolinians who were killed or mortally wounded at Gettysburg. In 1871 Charleston's Ladies Memorial Association, lead by Mary Amarinthia Yates Snowden, traveled to Gettysburg, disinterred the S.C. soldiers from shallow graves on the battlefied, and had them brought home. 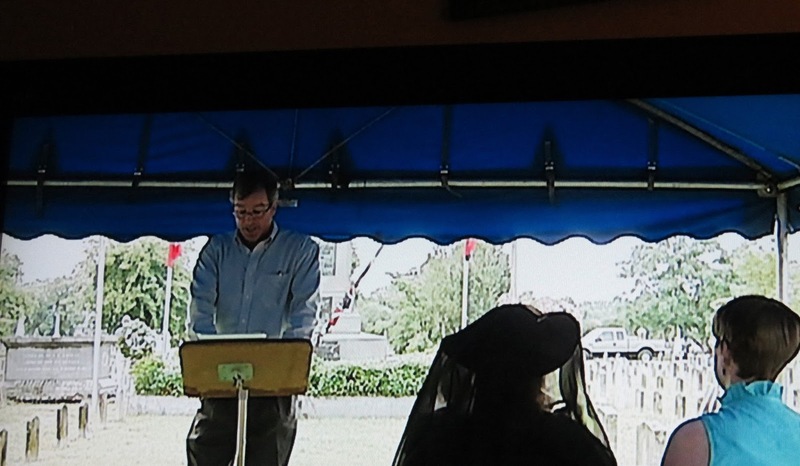 At this memorial service, their headstones were adorned with black ribbons (seen below behind the reenactors). More than 5,000 South Carolinians fought at the Battle of Gettysburg in the Confederate Army corps of Generals James Longstreet, A.P. Hill and cavalary commander Jeb Stuart. Of those 5,000, more than 300 died in the battle and nearly 1,000 were wounded. College of Charleston professor Patrick Harwood spoke about the role Palmetto State troops had at Gettysburg. Next, John Spear, historian and retired U.S. Navy commander, spoke about the efforts to bring home 82 sons of South Carolina who fell at Gettysburg. The cemetery flew its four official Confederate flags at half staff for the three days of the Gettysburg battle anniversary. Justin Harwood participated in the ceremonial raising and lowering of the flags. Joseph Harwood placed a wreath at the base of Confederate memorial. Jamie Parks (left) and other members of the Sons of Confederate Veterans took part in the event. The SCV men fired their muskets in a volley to honor those lost at Gettysburg. Cannon fire was provided by the SCV's Bennie Slay (right) who hand-built this Civil War cannon. 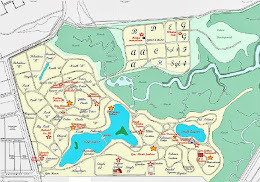 Bob Scholes assisted. Cain Griffen performed "Taps" at the end of the ceremony.Soldiers Ground at Magnolia Cemetery is the eternal home of more than 800 Confederates who died in the war, and some veterans. 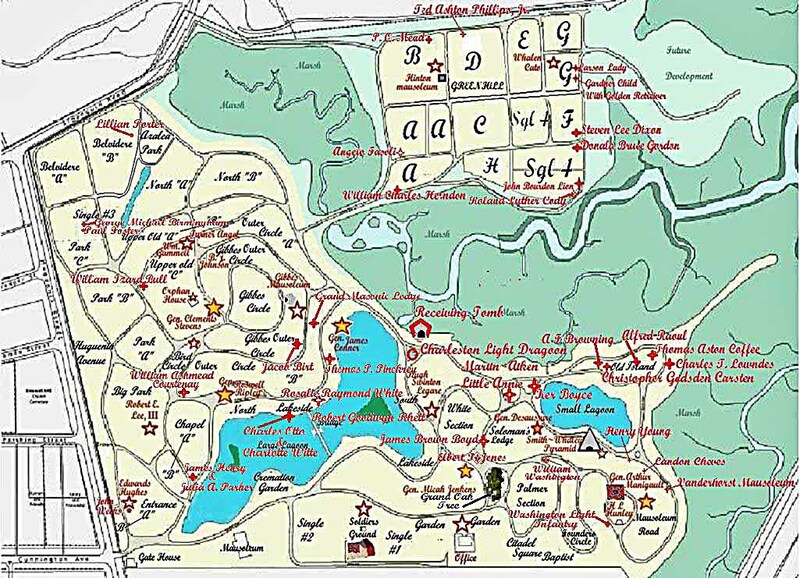 Overall, the cemetery has more than 2,200 Confederate veterans and war casualties on its 150 acres. Jamie Parks lead a rousing rendition of "Dixie" to close the event. Pictured from left, Patrick Harwood, Justin Harwood, Joseph Harwood and cemetery superintendent Beverly Donald. Gail Weatherford (far right) wore a period dress. 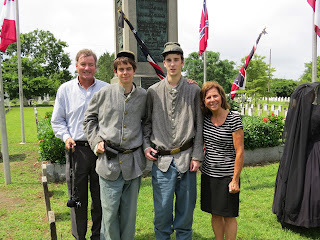 Magnolia Cemetery staff member Marcia Beczynski and Sons of Confederate Veterans reenactors. 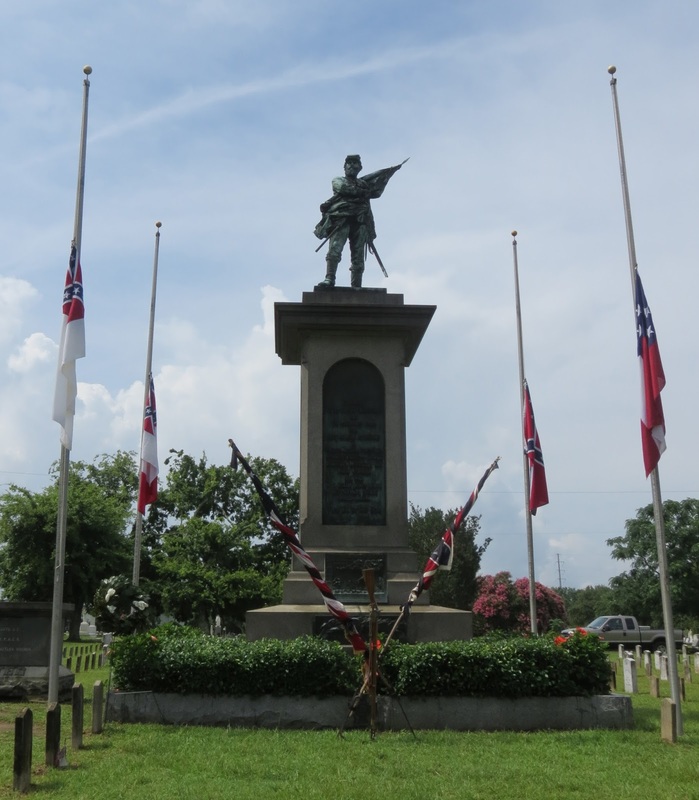 The Gettysburg memorial received widespread news coverage from Charleston media. The Post & Courier's Warren Peper, seen here with John Spear, produced a video of the event for the paper's online "My Charleston Today" segment.